One of the joys of the Dresden Music Festival is its use of Dresden's many historic buildings as venues for festival events. Each visit to the festival (this year is my 3rd visit) has taken me to a different selection of places. On Friday 16 June 2017 the festival was presenting a programme celebrating Martin Luther at the Palais im Grossen Garten. The festival's theme this year is Licht (Light), and events have incorporated celebrations for the 500th anniversary of the Reformation. Martin Luther: Prediger, Politiker, Privatmensch (Pastor, Politician, Private-man) featured the recorder ensemble Flautando Köln (Susan Hochscheid, Katrin Krauss, Ursula Thelen, Kersin de Witt) playing a wide variety of recorders, plus Torsten Müller (percussion), Stefan Bauer (vibraphone) and actor Martin Brambach. Dating from around 1680, the Palais im Grossen Garten is one of the earliest examples baroque architecture in Dresden, and the first important building in Saxony build after the 30 Years War. Badly damaged in World War Two, the ground floor features an atmospheric vault which houses a collection of 17th century stone sculptures brought indoors for their protection. The piano nobile is essentially a roofed ruin, providing an atmospheric venue for concerts. The concert combined Martin Luther's own words taken from letters and sermons, spoken by Martin Brambach, with music both of Martin Luther's time (Diego Ortiz, Marco Uccellini, Orlando di Lasso, Michael Praetorius, Sweelinck, Ludwig Senfl) with contemporary pieces by the vibraphone player Stefan Bauer. The first half included two substantial works by Bauer, Nun freuet euch lieben Christen g'mein and Verleih uns Frieden gnädiglich. These combined Brambach's recitation with music, sometimes as melodrama and sometimes alternating the two. At the beginning, Brambach declaimed atmospherically from the rear of the hall, but subsequently he stood at the front using a lectern with amplification. Bauer's style is very much modern jazz inspired, and the combination of vibraphone (sometimes two vibraphones) and recorder quartet (discreetly amplified) is not an obvious one. Bauer used the combination imaginatively and atmospherically. Each piece incorporated a chorale melody, both of which Bauer treated in striking ways. But ultimately this was about the text, Brambach's delivery was vivid indeed, this was no dry recitation, but his tendency to keep his eyes firmly on his notes rather took the edge off Luther's thunderings, and it would have been better if Brambach had looked his audience in the eye a little more. The first half also included a further selection music, a group of Middle-Eastern songs (sung by one of the recorder players), Arvo Part's Da Pacem Domine and a group of dances by the Spanish composer Diego Ortiz. These featured some superb recorder playing, and real toe tapping moments, yet I was unclear as to how the music (written by a Spaniard based in Naples and Spain) linked to the theme of the concert. This became more problematic in the second half where we heard a sequence of Martin Luther's letters, starting with one written just before his marriage and ending with one from eight days before his death, interspersed with music composers roughly contemporary with Luther. 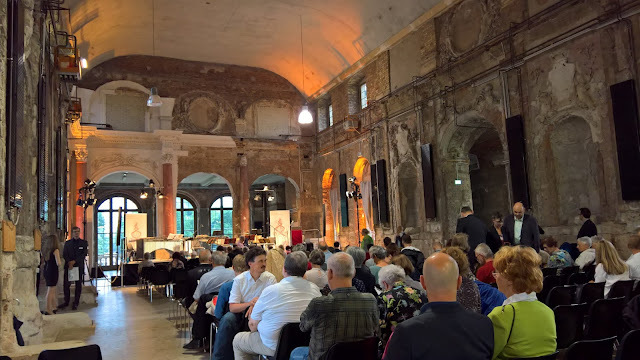 But this was music which he may not have heard; pieces by Marco Uccellini (who was born after Luther's death), and a group of anonymous French/Provencal dances seemed to have no clear link to Martin Luther. The connections seemed to be thematic, Luther's thunderings on the role of women were followed by Lassus's song from the other point of view, Ich hab ein Mann, der gar nichts kann (I have a husband who does nothing), and Luther's comments about wine were followed by the anonymous Quand je bois du vin clairet (When I drink red wine). Though having Luther's final letter spoken as melodrama over a Senfl motet was most moving. The admirable programme included an extensive essay on Luther and a short note by Bauer, but very little about how the music was selected. We finished with a final Bauer piece, Mit Fried und Freud ich fahr dahin which seemed the most effective, and structurally the most free, perhaps because the full chorale only emerged at the end. This was quite a long programme, and quite taxing for my rather limited German, but Brambach's delivery was vivid enough to carry us along. I only wish the 16th century items had had a clearer link to music which Luther might have experienced.